Automation Warehouse will not pass on any information gained through this site to anyone. We would like to be able to mail our customers specials from time to time (once per month) and to keep you updated with new products or specials that may help your shopping experience. You can easily remove yourself from these mailouts at any time. or withdrawn all together. We do reserve the right to make changes at any time. All goods are backed by a 12 month local warranty For customer service, please email us. Great care is taken to ensure that the prices we display are correct and all information is up-to-date. Pricing is however subject to change without notification. Availability of items also may change and is subject to prior sale. The customer will ALWAYS be notified where any discrepancies occur before the order is accepted. Our minimum delivery fee is $25. Delivery pricing quoted is for up to 10 items. Automation Warehouse reserves the right to change the delivery fee for remote areas or bulky products should the cost from the courier be higher. We will ALWAYS discuss with the customer before accepting the order. One of Automation Warehouse's top priorities is to have the fastest delivery time in Australia and we are building systems to ensure this. Delivery speed is obviously subject to stock levels, the time you ordered, and courier time tables. We will try to keep you informed of any delays. Currently we deliver to all regions of Australia, NZ, and PNG. 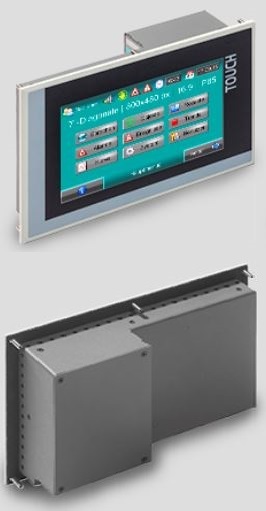 640kB work- and 24MB visualisation memory the INSEVIS-Panel-PLC with WVGA in 16:9 format. The brilliant display is an eye catcher, large library of graphical objects make this panel a powerful but easy to create visualisation. The integrated CPU-P includes onboard interfaces, Ethernet (S7-communication, TCP, UDP), Modbus (TCP, RTU), CAN (CANopen and Layer2), RS232 and RS485 (free ASCII) and optional Profibus DP (Master, Slave).